Foodies, get ready–this year’s Regional Flavours’ program is shaping up to be bigger and better than ever! Held in Brisbane’s picturesque South Bank parklands on 16-17 July, Regional Flavours will shine a spotlight on fresh tastes and local produce and feature presentations from big names including Maggie Beer, Adriano Zumbo, Gary Mehigan, George Calombaris, Paul West, Lola Berry, Phoebe Wood and Miguel Maestre. My only advice: start your pre-eating training NOW; maybe add a couple of extra snacks into your day, throw in a dessert and maybe a midnight snack, because when you clap eyes on The Jetty’s King Prawn tacos with their vibrant mix of avocado, sweetcorn, tomato and coriander salsa or catch a whiff of Popolo’s Crumbed Mozzarella with local thyme infused honey, you’re going to want to eat ALL THE FOOD. I speak from experience because Katy Potaty and I were two of the lucky few South Bank invited to taste test some of the amazing local produce that will be on offer as part of the two-day food and wine festival. For two days last month, I ate like I was the love child of Augustus Gloop and Violet Beauregarde from Charlie and the Chocolate Factory. All I needed was some Oompas Loompas to roll me home. Taco? Yes please. Grilled corn? Hand it over. Giant test tube of soup? Down she goes. Our two-day progressive feast started with a picnic on the grassy knoll at South Bank’s River Quay. 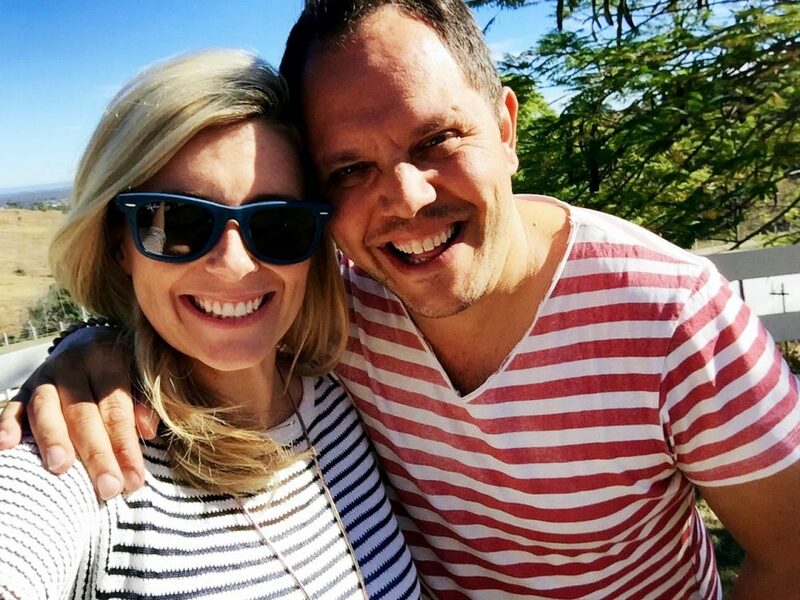 As Katy and I mixed and mingled with other foodies/bloggers under bright outdoor umbrellas, we were treated to waterfront views, Sirromet wine and gourmet fare from The Jetty, Popolo, Stokehouse, Cove and Aquitaine Brasserie. South Bank’s River Quay will River Quay will be serving up waterfront views, gourmet fare and fine wine on July 16 and 17. Styling goals … when your macarons match the picnic blanket. Sirromet Wines have collected more that 794 prestigious national and international wine awards since opening in 2000. The Jetty’s Straddy king prawn taco, avocado, sweet corn, tomato and coriander salsa. Bee One Third operates over 60 beehives extending from Northern Brisbane all the way down to Northern New South Wales which is why each of the jars of honey are a different colour. Queensland pork belly and black garlic dumplings, XO sauce from Cove. Popolo’s Crumbed mozzarella with local thyme infused honey. Bottoms up to beautiful days spent by the Brisbane River. Cheese and honey … a winning combination. Salted caramel and hazelnut chocolate tarts with clotted Barambah Dairy cream, fresh berries from Cove. The Brisbane Wheel, South Bank. No one touch the food! #Bloggerlife. Each restaurant will offer a handful of meals and drinks over the weekend, with food priced at $8 and under, and drinks between $2 and $8. On the drinks front, I can’t wait to try Jetty’s Passionista (Beefeater gin, passionfruit, Buderim ginger, lemon, Angostura bitters) and Cove’s Special Sangria (Finest Call sangria mix, red wine, Golburn Valley orange juice, lemonade and fresh fruits). With round one of the feast complete–my final tally came in at one taco, three dumplings, four pieces of mozzarella, five macaroons and the salted caramel and chocolate tart–we were joined by Brisbane Greeter Sue who took us on a walking tour of South Bank. Along the way we stopped at the mostly edible Epicurious Garden where visitors will be able to get back-to-basics with man of the earth, chef Paul West *swoon* from River Cottage Australia. Paul will appear both days to share his knowledge on sustainable eating, garden gastronomy, root to stem eating, and how to reconnect your kitchen with the land. There will also be sessions on cheese making, permaculture, fermentation and bee keeping by local experts, including Jack Stone from Bee One Third. 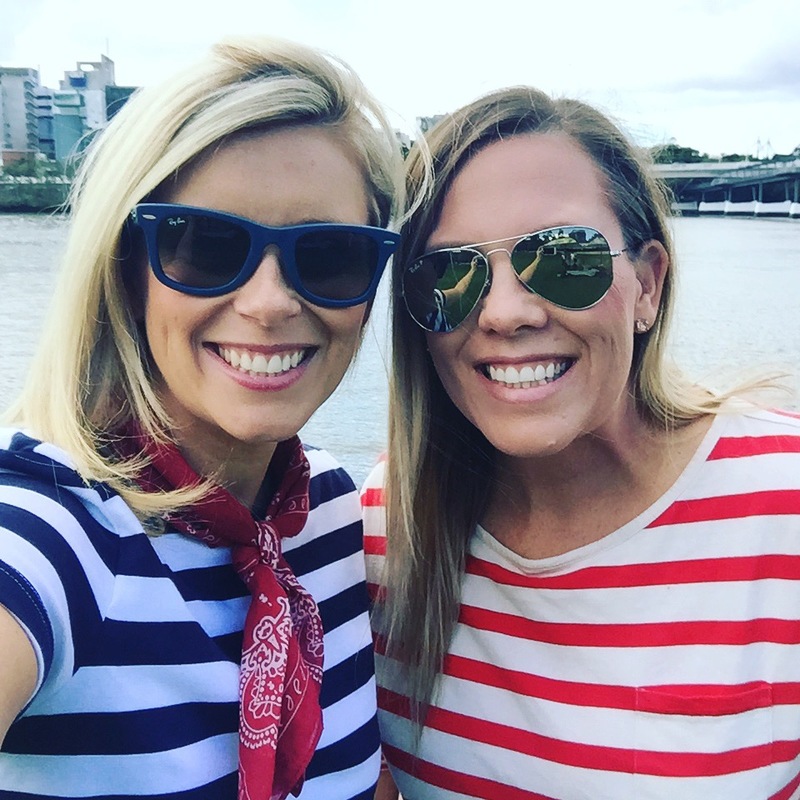 Self proclaimed Brisbane ambassadors … As well as trying to recruit people to move to Brisbane, Katy and I also made them swear allegiance to #teamstripes. By 4pm, I was regretting my choice of clothing; wishing I’d opted for a kaftan or muu-muu rather than jeans and horizontal stripes. After a few #BrisbaneAnyDay snaps of the Wheel of Brisbane and the BRISBANE sign, it was on to The Charming Squire for a brewery tour, beer tasting and— you guessed it—more food. The Charming Squire will bring tasty winter fare, beers and ciders to The Hunting Club–a pop up bar and bistro which will champion a paddock to plate experience. There will be craft beers available from Newstead Brewing, Balter, Green Beacon and Four Hearts and visitors can see panel discussions with local brewers and demonstrations from celebrity chefs including Luke Hines, Hayden Quinn and Paul West. It’s fair to say The Hunting Club is going to be packed full of women who desperately want to perv on men who know their way around the kitchen learn more about food. Naturally, I’ll be there. The Charming Squire, Grey Street. Pic by Visit South Bank. Darling Downs Beef Croquettes with Turkish almond and tahini dip, watercress and basil oil. The Charming Squire is also a working James Squire brewery. Beer tasting is a tough gig. You’ll also be able to catch our new mate (and #teamstripes recruit) chef Alastair McLeod saying ‘Tata to Tartare’ on The Hunting Club stage at 11am Sunday where he’ll reveal how to create the best quick-cook beef, why meat quality is so important, and how to embrace rare steak. Lockyer Valley ambassador, chef and Where’s Wally impersonator (and good sport) Alastair McLeod will be appearing Regional Flavours. At 6pm–having now eaten the equivalent of EIGHT dishes–it was time for a quick pit stop at home for a change of clothes (something without a waistband) and I was off to the Brisbane Marriott Hotel for pre-dinner drinks on their terrace overlooking the Story Bridge. As the city lights twinkled around us, Executive Chef Peter Iwanczyk popped open a bottle of Perrier-Jouet champagne and announced that he’d whipped up a few little treats for us to try. At this stage, I was starting to think I should have followed in the footsteps of Eddy from Portmanteau Press who tasted most meals but didn’t polish off the entire plate. Peter’s selection included Scallops with Truffled Cauliflower, Spanish sausage, green peas and burnt butter vinaigrette, Tasmanian Atlantic Salmon with chickpea, fennel and roasted pepper salsa and a Pulled Pork Burger on Turkish pose with coleslaw and English mustard mayonnaise. Scallops Truffled Cauliflower with Spanish sausage, green peas and burnt butter vinaigrette. Champagne is always a good idea, especially when it’s accompanied by this view! Thai Beef Salad and Chef Crafted Soup. Photo by Visit South Bank. He topped it off with blackberry macarons which often appear in Marriott Brisbane’s High Tea offering and were so delicious, I couldn’t resist a second one. Peter will be serving up a sweet Deconstructed High Tea demonstration at the Sweet Escape section of Regional Flavours on the Saturday morning. Ditching my jeans in favour of a loose little black dress gave me more breathing (eating) room which was necessary because we still had a five course degustation at Tukka on our schedule. Tukka combines ingredients from Australia’s bountiful countryside, oceans and bays with native herbs, spices and berries for a true taste of Australia. ‘Amuse bouche’ is a French term which means a little bit of food which is served before the meal to stimulate the appetite. Native Plate made with crocodile, emu, kanagaroo, quandongs, Lilly Pillys, desert limes and muntries and damper with lemon myrtle dukkah and olive oil. What’s up, Skip? Our Native Plate included Fennel Seed Kangaroo and Coriander Kangaroo. Strawberry gum cured crocodile cerviche served with finger lime dressing, watermelon, micro basil and freeze dried mandarin. This Rosella and lemon sorbet was a delicious palate cleanser. Seared Kangaroo Fillet, roasted pumpkin puree, charred zucchini, samphire and a balsamic jus. After more than 10 hours of eating, I was delirious. Tukka’s Head Chef Bryant Wells delivered the goods and we tried both Wattleseed Crocodile and Strawberry Gum Cured Crocodile Ceviche (fresh crocodile marinated in citrus juices) served with finger lime dressing, watermelon, micro basil and freeze-dried mandarin. I preferred the ceviche over the Wattleseed Crocodile, but the highlight of dinner was the palate cleanser of Rosella and Lemon Sorbet. It was light and sweet, but with just the right amount of tang. Bryant will be presenting at the Epicurious Garden on Sunday, where he will showcase some lesser-known native ingredients, how to use them and what you can grow in your own garden. By 10pm, after what felt like 10 hours of eating, our end of the table began quizzing gorgeous 20-something Eddie on 80s and 90s pop culture, culminating with an impromptu sing along of 4 Non Blonde’s What’s Up, which really set the tone for day two of our Regional Flavours adventure. Keep an eye out for next week’s post which will share all the shenanigans from our road trip to the Lockyer Valley. To see the full program of events, visit the Regional Flavours website, regionalflavours.com.au. If you’re from out-of-town but don’t want to miss any of the action, Brisbane Marriott Hotel is offering a special discounted rate of $199 a night for stays between 14-18 July 2016, if you book before July 1. Love your review. Can’t wait to read about your adventures in the Lockyer Valley! It’s coming next week, Nicole!